The World’s First Personal Digestive Tracker! It sounds like a quantum leap from giving maths grinds in your parents’ sitting room to becoming the Chief Operating Officer of the highly successful tech start-up ‘FoodMarble‘ ­­– but for Dr. Lisa Ruttledge that’s exactly what happened in a relatively short space of time. And it all came about on the back of the digestive difficulties being endured by a friend’s girlfriend! A graduate of UCD where she studied for a degree in Electrical Engineering, Lisa Ruttledge was one of a miserly five female students in her undergraduate class of 30. It was very male-dominated, the Kildare native recalls, adding however, that, to the university’s credit, there were a number of truly inspirational female role models in the engineering department, something which was very important to the thin scattering of female students. 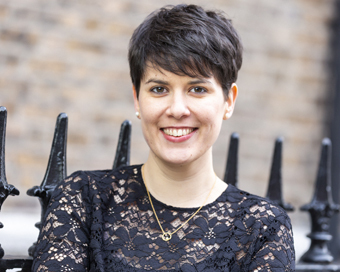 While studying for her PhD, Lisa even developed a special programme to help her students navigate the Leaving Certificate honours maths system (her thesis, by the way, focused on the integration of renewable energy into large-scale power systems). However, after bumping into entrepreneur, inventor and venture capitalist Sean O Sullivan of the international firm SOSV at an event, Lisa got talking to him about maths education – and ended up with a job: “He’s very interested in maths education, and at the time he was running a national maths competition. “He was looking for someone to host workshops as part of the finals of the programme,” recalls Lisa, who, as a result of that meeting suddenly went from running a maths tutorial in the sitting room of her parents’ house to delivering a national maths workshop to 500 second level students in four locations around the country, working with 37 volunteer tutors. “That was probably my first foray into entrepreneurship in the sense of developing something from nothing,” she says, adding that the experience of designing the workshops and executing an initiative of that size was hugely positive. The workshops took place in May 2014 and were a great success. Even more significantly, however, Lisa, who went on to finish her PhD in January 2015, had made what would turn out to be a very important professional contact. Lisa and a fellow engineering student and friend, Dr Aonghus Shortt, had for some time been discussing the possibilities of an idea of Aonghus’ which was inspired by his girlfriend’s experience of Irritable Bowel Syndrome and ongoing digestive problems. Aonghus’s brainwave focused on the concept of hydrogen breath testing, a system which identifies food that creates an adverse reaction in the body: “When someone eats something and the body doesn’t absorb it properly, hydrogen is produced and can be detected on the breath,” Lisa explains. In other words, the presence of hydrogen is an indicator that food hasn’t been fully absorbed in the small intestine and is being fermented by bacteria in the large intestine, which can lead to uncomfortable digestive symptoms for some people.“Aonghus said that hydrogen breath testing was being used in a lot of gastroenterology departments in big hospitals around the world, but that the equipment being used was large and extremely expensive.” He had, as it turned out, spotted a golden opportunity. From about February 2015 Lisa and Aonghus – who is now FoodMarble’s Chief Executive Officer – began to seriously investigate the possibility of developing a small, hand-held, breath-testing device which would use sensor technology and be both convenient to use and affordable for the ordinary person with digestive difficulties. “Aonghus was looking for someone to partner with to make the device and I was very interested,” she recalls. Towards the end of that year, another college friend and engineer, Dr Peter Harte, joined the duo and later became FoodMarble’s Chief Technical Officer. Together the trio developed a basic working prototype, and were accepted onto HAX, the largest hardware accelerator programme in the world. Based in Shenzhen, China HAX is run by the global venture capital operation SOSV – of which Sean O’Sullivan is Managing Director: “We had a basic working prototype when we joined HAX. During the four months of the programme we intensively developed the prototype and the business,” says Lisa, who spent much of her time back in Ireland, working on the business development aspect of the trio’s fledgling company FoodMarble. “FoodMarble’s mission was to help the one in eight people who experience regular digestive difficulties, by identifying particular foods which cause problems for them.” On completion of the HAX programme in May 2016, the team flew to San Francisco for a special HAX Demonstration Day, at which they showcased their pocket-sized breath analysis device – the world’s first personal digestive tracker. Designed in California and Ireland and manufactured in China, the device allows users to log their food and symptoms and to take breath tests throughout the day to track how well the food is being digested. When food isn’t fully digested, it’s fermented in the gut, creating hydrogen. Since some of this hydrogen is ultimately exhaled, the device is able to measure hydrogen levels on the breath to show whether food has been fully digested or not. As more breath tests, foods and symptoms are logged, the app gives the user insights into how different foods, sleep quality and stress affect their unique digestive health. More than 8,000 people around the world had pre-ordered the FoodMarble device. All pre-orders have been fulfilled and the device is now on general sale at €169 ­– meanwhile, the company already has a workforce of 16 and plans to create more positions in Dublin as it continues to grow. To date FoodMarble has received more than €1.7 million from a range of investors including SOSV and London-based VC firm Breed Reply.